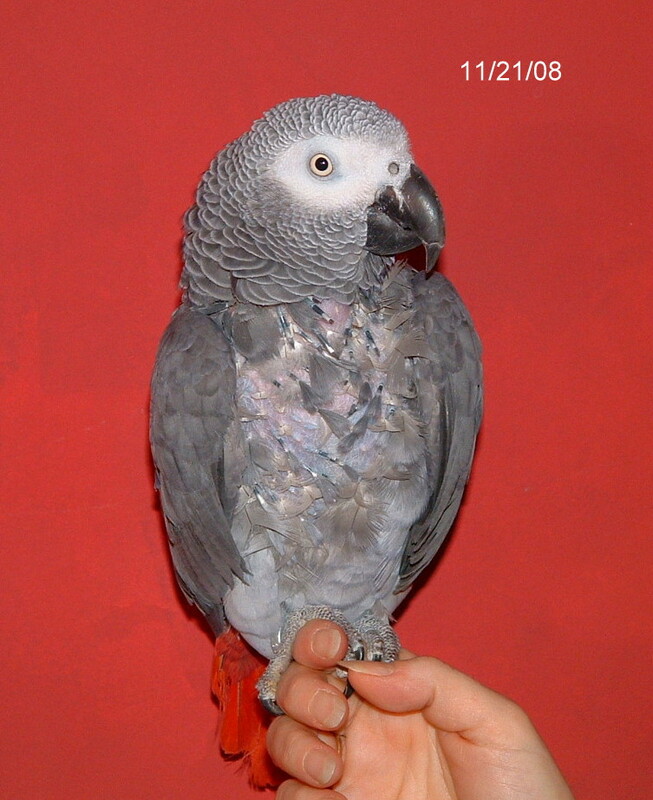 This is our Congo African Grey Jerry. He is 22 years old. He is a real entertainer. 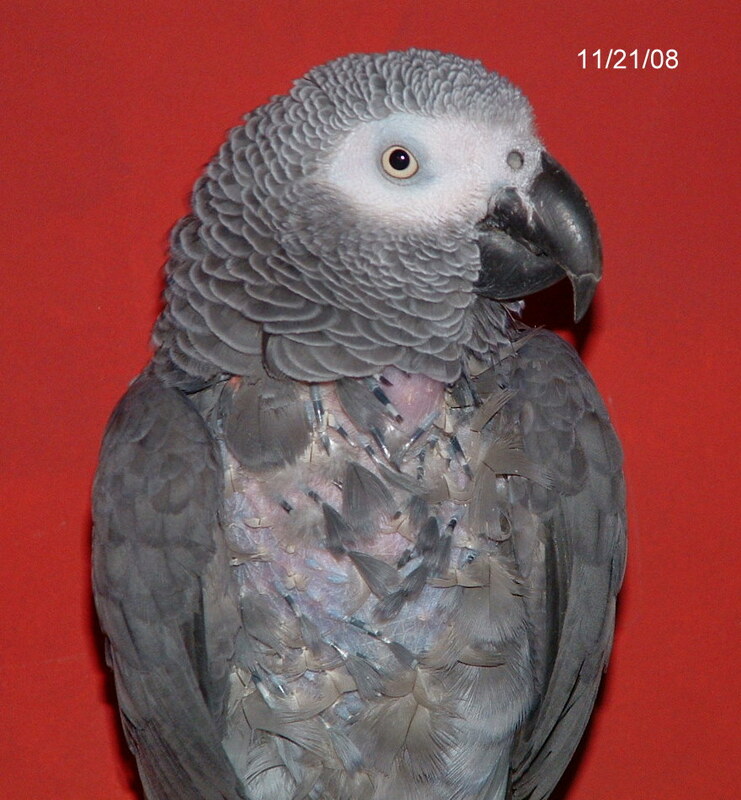 He loves to sing "Take me out to the Ball Game" and two versions of "Happy Birthday", one version is "Happy Birthday" and the other is "Happy Bird Day". He keeps the whole flock laughing. Jerry also knows his first and last name as well as his home telephone number. Jerry is also our Amazon Kiwi's personal trainer. Since Kiwi needs to walk up our steps to get exercise on a daily basis, Jerry is right there by his side saying "Come on, Come on" to give Kiwi some extra incentive. After many tries of having Jerry sleep in different rooms, his plucking never stopped. We decided to contact a pet communicator. We have done this in the past for all our other birds. We were very determined to stop Jerry's plucking so we decided it was time for Jerry to have a reading. 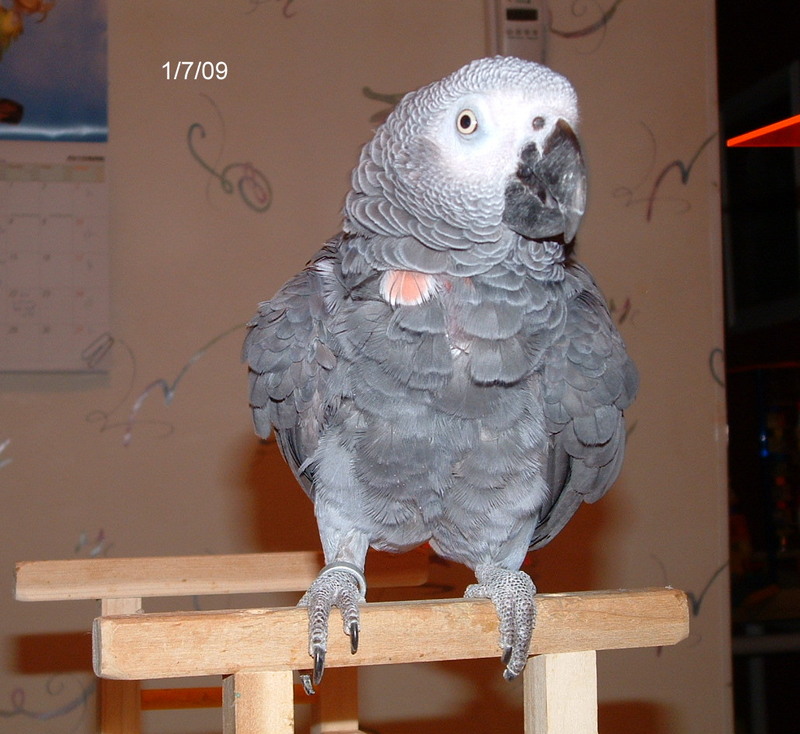 We contacted Animal Communicator Karen Anderson and made our appointment. We never had a reading with her for any of our animals. 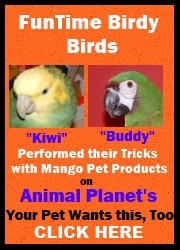 As she says on her website, send her a picture of the animal that needs the reading and she will contact them. With this being the case, we sent her a picture of Jerry fully feathered so she has no pre-conceived reading on Jerry. I am very happy but they don't let me wander enough....I am a happy wanderer......I am a happy wanderer. Jerry loves to wander on the floor and just get into mischief. My husband makes fart noises as he kisses his feathers. Thus now Jerry makes his own farting sound back and says "Who farted" and then starts to laugh. From what Karen could read is that Jerry would want more one on one time to engage him. He wants the attention to be on him. Before we made the appointment with Karen Anderson we told Jerry to tell us something only we would understand. Jerry makes a "T" "T" sound every night before I put him to bed. I say to him in a whisper "if you want to capture someone's attention, just whisper". Jerry's response to this is making a "T" sound. Is this my forever home? I was rooted around trying to find a good home. I think I found one....but do they? Do they know how much I love them? Can I be funny enough? I love it when they laugh at me. I am in a really good home.....do they think so too? The above really hit home with us and is the root of Jerry's plucking. 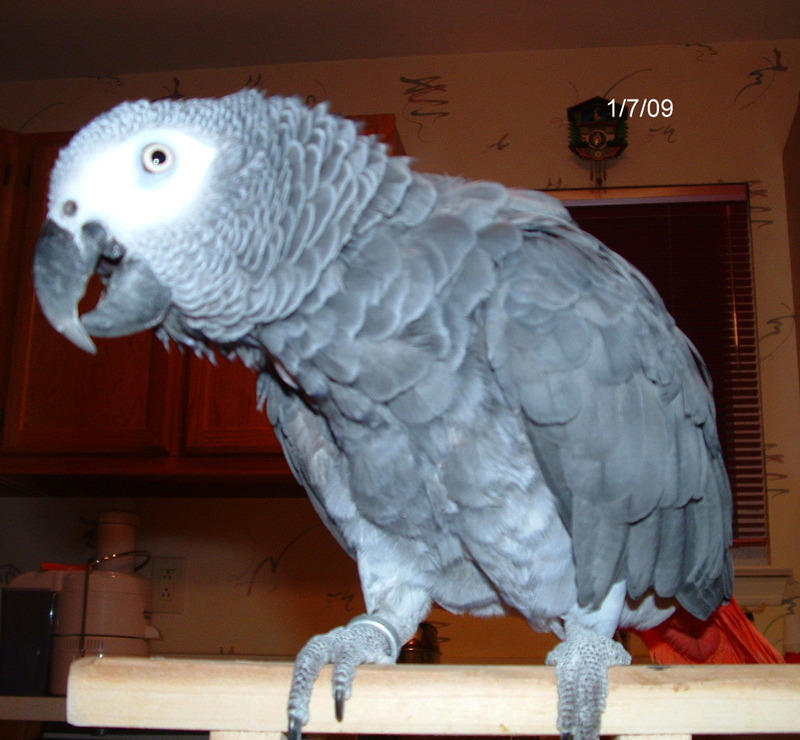 When we went away in May of 2008, my mom's bird, Sparky, came to stay with all our other birds because my mom was going away with us. We contacted another Animal Communicator in June after we got back and she said that Sparky, told all the other birds on the 4th day of our vacation that they were not coming back and we were all going to be abandoned. This must have really affected Jerry because when we came back his front chest was fully plucked.Our home is Jerry's 4th home in his life and when he said "is this my forever home" my husband and I had tears rolling down our faces. Jerry always makes us laugh and keeps us in stitches. He must believe that if he is funny he can stay and we won't give him away. This is Jerry's forever home and we tell him ever day. Over the next 4 days Jerry did not pluck one feather. That was amazing because for the past 6 months he has plucked at least 4 to 10 feathers each night. Jerry on the 5th night did have a set back though but went another 8 days of non feather plucking until he had another set back Thanksgiving night. On Thanksgiving Day, Jerry saw Sparky again. Sparky comes over with my mom on all major holidays. We feel once Jerry saw Sparky again it must have triggered Jerry's feeling of abandonment and he got worried again. We feel confident after the Karen Anderson reading that we have found out more than we ever have about Jerry's plucking problems. The future looks bright for Jerry and his feathers. By the way Karen also teaches an internet class on how to communicate with all animals. We were skeptical if we could do this but we took the class anyway. To our amazement, we were able to talk to other people's animals who signed up for the class. Karen walks you through the steps on the communication process and before we knew it, we were talking to dogs, cats and birds and with pretty good accuracy. We have now discovered that Jerry is afraid of the dark!! Jerry normally sleeps in our room on the Junior Playgym. After Jerry's set back on Thanksgiving we realized that Jerry gets scared when we get up in the middle of the night to go to the bathroom or when Mark snores and I shhhhh him because I can't sleep. (LOL) We now think that Jerry must have been moved to another home when it was dark out and he had been sleeping. He now associates any sound in a dark room with the thought that he will be leaving. When we were ready to go to bed, we brought Jerry out to our den which is a walk through den with 2 doors. We thought if he didn't hear us moving around at night he would get a good night sleep and not pluck. We shut off the light closed both doors and went into our room. When we woke up the next morning we found Jerry had plucked all his new pin feathers out. We were beside ourselves. We went out and bought a night light for Jerry the next day. The next night we used the night light and still the next morning more feathers were plucked. He was scared of the shadows the light cast on the room. We knew this because we could see Jerry's look of fear when the night light went on. We thought maybe Jerry wants a real light on???? The light in the room has a 3 way bulb so we thought maybe we can leave the light on the lowest setting. When we woke up the next morning Jerry did not pluck a single feather. Jerry has been happily sleeping in our den for the last 6 weeks and has 99% of his feathers back and has not plucked a single feather since. We have our nightly ritual of putting Jerry to bed with lots of hugs and kisses and Jerry tells a couple of jokes(remember it is important to him that he makes us laugh). Then we close our door and Jerry makes the sound of the keypad of our burglar alarm and we know we have to put the alarm on for the night. Then Jerry knows everyone is safe for the night.